Very much in the festive spirit (partially in reference to our previous blog entry here), this week at Season’s Eatings we’ve been busy baking some delicious and simple Christmas cookies made with macadamia nuts, cranberries (as our seasonal fruit) and a colossal quantity of white chocolate. There is no defending these cookies on the naughty side of life, but it is Christmas and it is a fact that the tastiest treats are made with chocolate, butter and sugar. 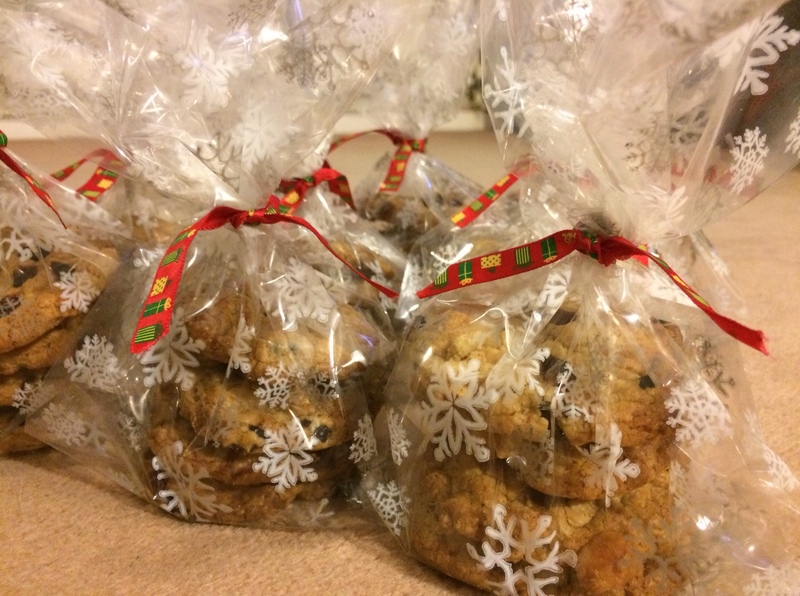 You can make these cookies as a treat for the house or equally package them up (if you can bear to give them up) as an edible present. Pre-heat your oven to 180ºC. Then line a couple of baking trays with reusable baking parchment (if you have it) or greaseproof paper. Set up a large heat-proof mixing bowl over a pan of simmering water, being careful that the bowl doesn’t sit in the bubbling water. Add just under a third of the white chocolate and butter to the bowl and leave to melt gently. The mixture may appear to separate, but if you give this a thorough stir with a wooden spoon, you will soon get a smooth texture. If you don’t have a suitable heatproof bowl available and want to skip the idea of a Bain Marie, melt the butter and chocolate in the microwave in several 10-20 blasts and stirring thoroughly between each zapping. Once the chocolate and butter is completely melted, leave to cool for a minute before adding the sugar, eggs and vanilla extract. Beat thoroughly until everything is well combined and smooth again. Finally sift in the flour, cinnamon and baking powder and fold into the mixture. 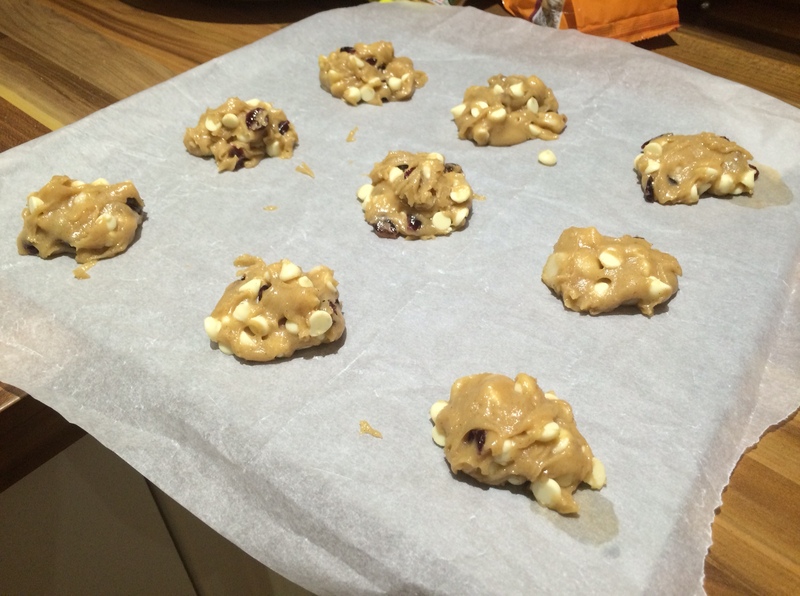 Add the remaining white chocolate, chopped nuts and 100g of the dried cranberries and fold these in too. Using an ice cream scoop or dessert spoons, dollop equal sized blobs of cookie mixture onto the baking tray(s), equally spaced as they do spread out by a couple of centimetres. 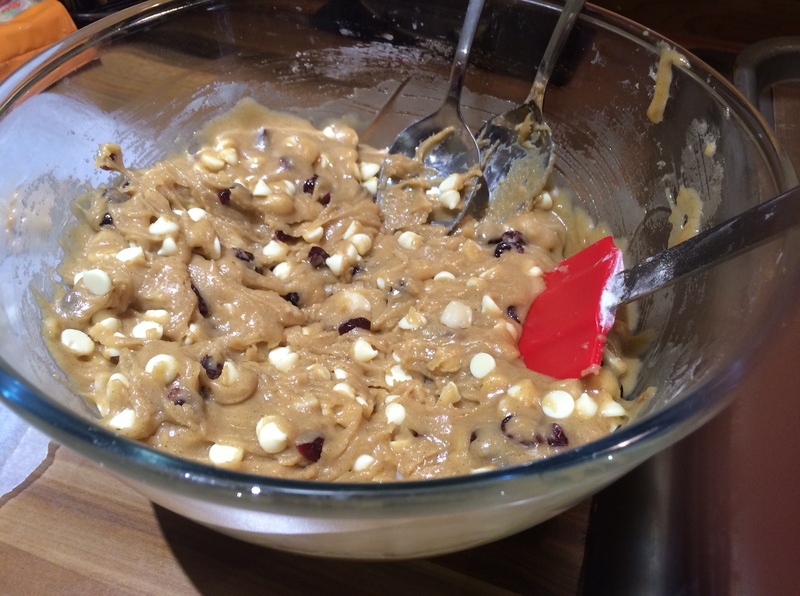 Top each cookie with a few of the remaining dried cranberries. Bake these in the oven for 12 – 14 minutes until golden. Remove from the oven and allow 5 minutes to firm up slightly before transferring to a wire rack to cool completely. Repeat for remaining batches of the cookie mixture. How much butter? What is the baking temperature? 200g butter, and 180C for the oven temperature.